Soon after Fortis Healthcare was set up in 2001, Shivinder Mohan Singh was being interviewed by a magazine. Just 26 years old then, Singh was at a loss for words when asked the inevitable question about future plans. "We want to be big," he said. How big? "No clue how big…," Singh recalls fumbling for words, "...just... big." Fortis, set up by Singh and his elder brother Malvinder Mohan, who were the promoter family in Ranbaxy Laboratories, the country's largest pharmaceutical company by sales, had nothing on the ground at that time. It had been allotted land for a hospital in Mohali, Punjab, and that was that; no investment had been made. In the intervening years, the Fortis network has multiplied through acquisitions, construction of new hospitals and management contracts. The expansion was turbocharged after the brothers sold their 35 per cent stake in Ranbaxy, grown to scale by their father Parvinder Singh, to Japan's Daiichi Sankyo three years ago for Rs 10,000 crore. With the deal, they wrote a twist in the story of India's business families, most of which are known to cling to their companies even in decline. Fortis had 28 hospitals when it acquired pharmaceutical company Wockhardt's chain of hospitals in August 2009 for Rs 909 crore, increasing its network to 38. On a wet day in August, when BT met the Singh brothers at the Fortis hospital in New Delhi's Vasant Kunj, the chain had 62 hospitals. By the time this story went to press, the number had grown to 66. Apollo Hospitals, the 28-year-old chain set up by Prathap C. Reddy, 78, who manages the company with his four daughters, is the segment leader with 10,980 beds - 73 per cent of them operational - in 63 hospitals. Fortis's 66 hospitals have a capacity to take 10,270 beds, of which less than 40 per cent are operational. In revenues, Apollo is way ahead with Rs 2,605 crore in the last financial year to Fortis's Rs 1,482 crore. However, Fortis's many new additions to the network will start yielding more as they come into their own. "Apollo has been slow in acquiring and relies mostly on greenfield projects to expand. If Fortis continues with its acquisition strategy, it will soon surpass Apollo," says Rashesh Shah, an analyst with ICICI Securities. Fortis has already surpassed Apollo on average revenue per operational bed - Rs 87 lakh a year versus just above Rs 80 lakh for Apollo. And yet, Shivinder, much more articulate now and given to twirling his moustache every once in a while, still struggles to define 'big': "The roll-out is happening so fast that I have stopped defining big… There will be at least 80 hospitals by the end of this financial year. We are just putting the network together; growth is happening on a default basis." In a country where organised chains account for just six per cent of the hospital bed capacity of 1.3 million, there can be no dearth of growth prospects. After he graduated in mathematics from Delhi's St. Stephen's College, Shivinder was asked by his father Parvinder - who first drew up the vision to make Ranbaxy a researchdriven global company - to work in the pharmaceutical sector. But the son's heart lay in health care. So in the mid-1990s, at the age of 21, Shivinder set out to prepare a business plan for what eventually became Fortis. In doing so, he had the advantage of a unique perspective, though it came through the unfortunate illness of his father. Parvinder was diagnosed with cancer in 1997 and his sons took him to the world's best hospitals for treatment. Wiser from these visits, they tried to see hospital functioning from the patient's and attendant's perspective. Right from the first hospital they took their father to in Mohali, they found themselves fretting over the little things. For instance, they found the signage in many hospitals telling people where not to go, rather forbidding. So Fortis marks various areas - including the prohibited ones - by the colour of doors and floor tiles. Over time, visitors would know where not to go without being told so by signage. In the United States, where the attendant-patient ratio is about 0.5, hospitals can make do with small lobbies. In India, the ratio is 10 times higher, which has translated into larger lobbies at Fortis. "We sat in hospital lobbies and discussed the good things there. We were clear that there would be no harm in copying them," says Shivinder. While giving the finishing touches to the Fortis plan after their father died in 1999, the brothers did not confine their vision to the patient's point of view alone. As managers, they burned with ambition, exemplified early in their Rs 650 crore acquisition in 2005 of Escorts Hospitals, including the iconic Escorts Heart Institute in the heart of New Delhi. In March last year, they even made a bid for Singapore-based Parkway, which is bigger than Fortis by revenue, and acquired a shade above 25 per cent equity in it. Eventually, they dropped the bid in the face of a counterbid by Malaysian sovereign fund Khazanah and walked away richer by Rs 320 crore, as the Parkway shares had risen 11.6 per cent in the interim. Fortis has also built five hospitals from scratch and taken on a bunch on management contract. The skew in favour of acquisitions has given ammunition to detractors, who say that Fortis is not adding much to the healthcare infrastructure. In response, Shivinder hums the first line of an old Kishore Kumar number: "Kuchh to log kahenge, logon ka kaam hai kehna (which roughly translates to 'people will always find something unkind to say')." Malvinder, though, is all businesslike. "The question is whether the existing capacity is productive," he says. His contention is that existing hospitals become more efficient, operationally and financially, after they come under the Fortis banner. That adds to the healthcare infrastructure. A few weeks ago, the brothers entered a board meeting at the same time dressed in identical clothes, down to the neck tie. When we meet them, too, they are dressed almost alike, only the ties are slightly different. They speak the same language. Shivinder sounds a little more adventurous at times, but the two often end up finishing each other's sentences. That works well for the business. While Shivinder was building Fortis, Malvinder rose through the ranks at Ranbaxy, eventually becoming its CEO. 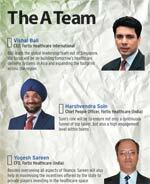 At Fortis, Shivinder, as the Managing Director of Fortis Healthcare (India) Ltd, looks after the Indian operations. Malvinder, as Group Chairman, runs Singapore-based Fortis Healthcare International Pte Ltd, the global arm. The two together decide the strategic direction. Says Sunil Godhwani, who runs Religare Enterprises, the financial services outfit started by the brothers soon after Fortis: "At the time of selling Ranbaxy they demonstrated the difference between obsession and possession. For them, equity ownership is just possession, which has to be dislodged at the right time and price." The next few years will be breathless. Fortis plans to enter secondary care with 25 hospitals in the next three years in Tier-II and III towns under a new brand. These will be 100 to 150 bed, no-frills hospitals that will treat non-critical ailments and feed the city-based tertiary care units. The brothers see an opportunity of more than $400 billion in Asia and Australia. But that is not where they stop. "In five years we see ourselves as the leader and the most trusted healthcare brand in every market we operate in, and among the top 10 in the world," says Malvinder. So, what if someone comes along to offer a good price for Fortis? The answer, as offered by Malvinder, inevitably mentions Ranbaxy: "Fortis will be a global brand, bigger than Ranbaxy - something that India will be proud of."